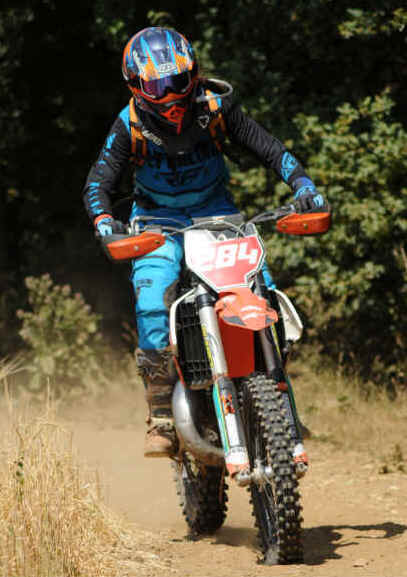 The third round of the G H Motorcycles/G & B Finch Aggregates Youth Hare and Hounds race took place at Foxborough Quarry Sible Hedingham after the main adult event. Again there was a small line up of riders this time there were five including 14 year old Georgia Potter who has been riding in the women’s national competition over the course of this year. The usual run to the bikes with Potter starting her engine first to lead but Sible Hedingham’s Will Belton was having none of it as he slipped on the inside of Potter at the first bend to take the lead. At the end of the first lap Potter had retaken the lead with Belton in hot pursuit while further back were Evan Herbert, Jemma Sargeant and Billy Sargent and there was nothing between them. For the first half hour there was nothing between Potter and Belton while B Sargeant managed to pass his second cousin Herbert also his sister Jemma. B Sargeant stalled his engine at the end of a lap while swiping his transponder but Herbert could not take advantage of it while disaster struck for Jemma her chain snapped around the course and it was pushed back to the Pits. Frantic work took place trying to repair the chain and a repair was made which took around 15 minutes then Jemma rejoined the race but only lasted a few hundred yards when it snapped again so she had to retire. In the meantime during the last ten minutes of the two hour session Belton was reducing Potter’s lead on every lap but Potter’s new gained experience counted as she turned on the power more to win from Belton by three minutes both completing 10 laps also third place rider B Sargeant completed 10 laps but was a further three minutes behind Belton. Coming in 4th was Herbert completing 9 laps.